Creamy Corn Casserole is a delicious, spicy, corn casserole made with a sriracha style cornbread and muffin mix. Creamy Corn Casserole is so easy, it’s scary. This casserole is so easy and so delicious, you might not ever eat corn any other way again. If your not keen on hot and spicy food you can substitute regular cornbread & muffin mix for the sriracha-style cornbread & muffin mix found at Aldi and omit the sriracha sauce. 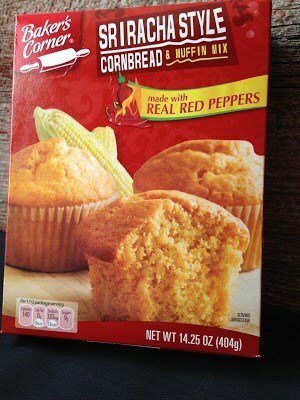 Another good choice is Honey Cornbread and Muffin Mix by Krusteaz. To add a festive touch to this creamy corn casserole, top it with a poblano pepper that has been cut in half, the seeds and membranes removed. You can leave on the stem or cut it off. Cut out three small triangles, two triangles for the eyes and one triangle for the nose. Make a jagged teeth, place on top and bake. 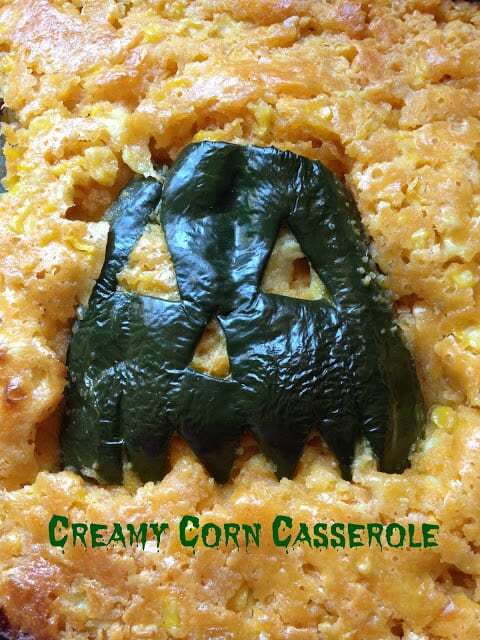 Creamy Corn Casserole is great served with Vampire Dip, Meatloaf Skull, Mashed Potato Ghosts, and Tombstone Krispie Treats. 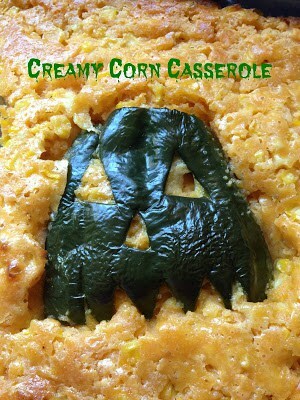 Perfect to serve your family and friends at your festive Halloween Dinner. Not only is this a delicious and satisfying meal, it’s relatively inexpensive to make and can be put together quickly. Another plus, all of the recipes are quite easy to make. Preheat oven to 350 degrees and lightly grease a 2-quart baking dish. In a medium bowl, combine butter, eggs, dry corn bread mix, whole kernel corn, sour cream, milk and sriracha sauce. Slice off the stem end and the bottom end of the poblano pepper. Slice the poblano pepper in half lengthwise. Remove the membranes and seeds, discard. With a sharp knife, cut 2 small triangles for eyes and 1 triangle for the nose. Make a jagged mouth. Place the poblano pepper in the middle of the casserole. Bake for 45 minutes to 1 hour in preheated oven, or until the top is golden brown. Hungry for more? Try these..Zucchini Squash Casserole, Tuna Noodle Casserole and Baja Fish Tacos.